Apple has moved to take down military-themed strategy game Afghanistan ’11 from the iOS App Store as it features the Taliban as an enemy faction. That comes from Slitherine development director Iain McNeil, whose studio publishes the game. He shared the news on his Twitter account. According to McNeil, the inclusion of the Taliban violates one of Apple’s long-standing policies that any games on the iOS App Store should not include ‘people from a specific government or other real entity as the enemies’. Displeased, he added that every other realistic account of war includes real enemy factions and finished with “and people wonder why we don't do iOS anymore." While disgruntled, McNeil confirmed to fans that a complaint has been lodged to Apple and that the team hoped to see Apple change its mind and let the game back in the store. McNeil also defended the contents of the game to another fan, who queried if ISIS would be allowed to have its own game if the goal was to eliminate people according to their religion. 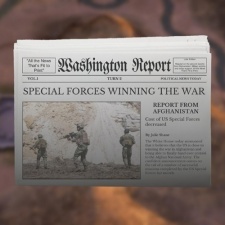 “I assume you don't realise the point of the game is to win hearts and minds, not kill insurgents,” McNeil replied. Apple has a history of its own for removing or rejecting games due to reflections of real life in wartime. Way back in 2011 the company blocked Origin System’s Pacific Strike for featuring Japanese Flags. Following a mass shooting at a black church in South Carolina back in 2015, Apple removed numerous games that featured the Confederate flag. Those included, HexWar Games’ slew of civil war titles Civil War: 1862, Civil War: 1863, Civil War: 1864 and Civil War: Gettysburg.